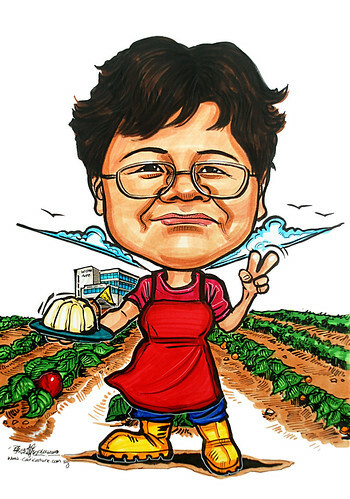 "I would like to do a caricature for my colleague who is retiring soon and leaving for Australia.....Possible to have the building in this website as a background http://aupe.org.sg/union/home.htm?......Ruby intends to buy a fruit farm and retire with her hubby in Brisbane. Our building as a background for remembrance. Not forgetting her cheesecake and almond jelly..."
Does a fruit farm look like this?Haha....I think so, based on what I have Googled."